Superhero Sayings: You will never have our hearts. 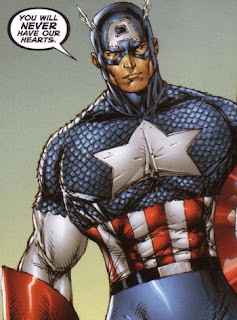 Captain America is known for his rousing speeches and he delivers this one while fighting an Onslaught possessed Iron Man in the Heroes Reborn universe after Onslaught threatens to control the minds of everyone on the planet. I found this trade collection to be quite entertaining but mostly because of the vastly improved Rob Liefeld artwork. If you're a fan of his work then don't hesitate to pickup a copy! This was also produced in honor of Sam Loeb and all proceeds went to the Sam Loeb foundation. Captain America's statement is especially relevant in a world where many people are oppressed in totalitarian regimes where governments attempt to control people's lives and minds ... but the battle for their hearts will never be won and it is in their hearts where hope will continue to live! References: Taken from Onslaught Reborn TPB (ISBN: 978-0-7851-3134-2) by Jeph Loeb (writer) and Rob Liefeld (artist).